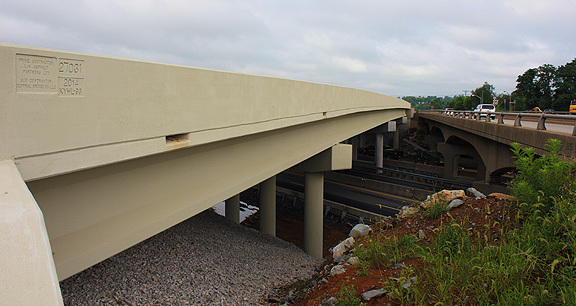 Project obstacles and solutions: As part of the New Circle Road widening project in Lexington, Kentucky, four bridges were constructed or reconfigured to handle two added lanes on the highway. This included building a new bridge to overpass the highway at Old Frankfort Pike. It also included widening bridges at Town Branch Creek, Wolf Run and Alexandria Drive. Central Bridge was hired as the general contractor on this project and ATS Construction provided all of the barrier walls and paving. The entire New Circle Road expansion project is on a fast track to be completed in less than two years. This includes reconstructing the overpasses, entry and exit ramps. Key to the construction schedule was the new bridge and ramps constructed at Old Frankfort Pike. As a main road crossing over New Circle Road, it was important to ease congestion by constructing this new bridge and getting it open to traffic. Concrete needed to be delivered quickly, but it also had to meet Kentucky Transportation Cabinet engineering specifications. IMI QC/QA worked with Central Bridge and ATS to design Class AA KYTC specified concrete for these projects. IMI QC/QA personnel were on site to test the concrete alongside KYTC technicians. This duplication of testing was provided to ensure proper readings of air, slump and strength. There were 15 different mixes for the four bridges. 20,000 yards of concrete was placed at these four bridge projects. All the concrete delivered by IMI met KYTC standards. The Old Frankfort Pike Bridge opened on July 19. The three other bridges were put into service on August 10 as traffic was diverted from the inner to the outer loop of New Circle Road. Construction on New Circle Road is scheduled to be completed in 2016. For more information on DOT specific mixes and on-site testing, contact one of our sales representatives. Click here.